AWX is an open source web application that provides the user interface, REST API, and task engine for Ansible. It's the open source version of the Ansible Tower. The AWX allows you to manage Ansible playbooks, inventories, and schedule jobs to run using the web interface. Firstly, we are going to install the main packages needed for AWX installation, it's the Docker and Ansible itself. Before installing these packages, update the Ubuntu repository using the following command. Now install the Docker and Ansible. 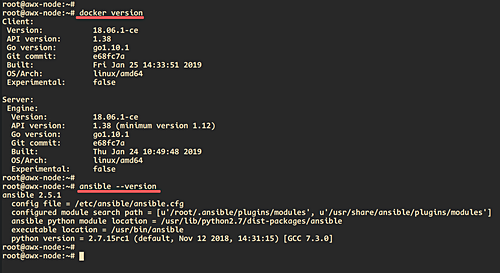 Once the installation is complete, check the docker and ansible using the following commands. Now we're going to install additional packages for AWX installation. 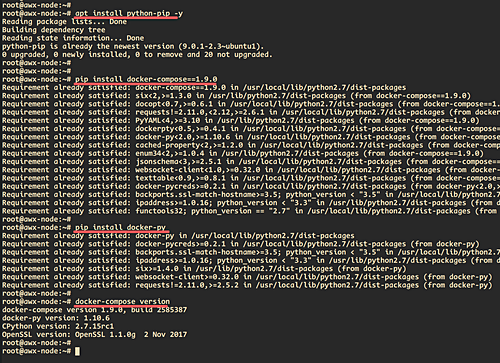 We will install the 'python-pip' package to the system, and then install the docker-compose and docker-py from the PyPI python repository. Install the 'python-pip' using the apt command below. Once the installation completed, install the docker-compose 1.9.0 and docker-py packages from the PyPI repository using the pip commands below. Next, we need to install the nodejs and the npm on the server. Once it's completed, upgrade the npm to the latest version. And as a result, all dependencies have been installed to the system. And we're ready to install the AWX. In this step, we will download the AWX source code and configure the inventory file for the AWX installation. Download the AWX source code from the git repository and go to the awx installation directory. After that, generate the new secret key for the awx using the openssl command below. Copy the generated secret key to your note. Now edit the 'inventory' configuration file. Change the 'postgres_data_dir' to the '/var/lib/pgdocker' directory. Change the 'host_port' to '8080'. Uncomment the 'use_docker_compose' line and change the value to 'true', because we're going to manage the awx using the docker compose. Now make sure the 'docker_compose_dir' is located to the '/var/lib/awx' directory. Change the credentials for the 'pg_password', 'rabbitmq_password', 'rabbitmq_erlang_cookie', 'admin_user' and 'admin_password' with your own password credentials. after that, change the secret key of the awx configuration using the generated key on top. Then uncomment the 'project_data_dir' and leave the value as default. Below is the edited of the 'inventory' file. And as a result, we're ready to install the awx on the next stage. Install the awx using the following ansible-playbook command. The playbook will do some tasks including downloading docker images and creating new containers postgresql, memcached, rabbitmq, the awx web-application, and the awx task. Next, go to the '/var/lib/awx' directory and you will get the 'docker-compose.yml' configuration. Then check all available docker containers using the docker-compose command. And you will be shown awx containers as below. Additionally, you can check logs of the 'task' service using the following command. After installing the awx, we will install and configure the Nginx as a reverse proxy for the awx that running port '8080'. Install Nginx using the following apt command. Once the installation is completed, go to the '/etc/nginx/sites-available/' directory and create a new virtual host configuration called 'awx' using vim editor. Now paste the configuration below. Change the domain name and the proxy_pass IP address with your own, then save and exit. Now activate the 'awx' virtual host and test the nginx configuration. Ensure there is no error with nginx configuration, then restart the nginx service. As a result, the Nginx installation and configuration as a reverse proxy for awx has been finished. Add the SSH, HTTP, and HTTPS services to the UFW firewall configuration. Now start and enable the ufw firewall service. Type 'y' to yes and the ufw firewall has been configured. Open your web browser and type your awx URL in the address bar. And you will be shown the awx login page as below. Now type the user 'hakase' and password 'hakasepass', then click the 'sign in' button. 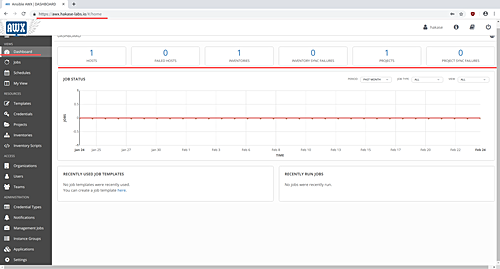 Now you get the awx admin dashboard as below. And the installation of Ansible AWX with Nginx reverse proxy has been completed successfully. I can't seem to find the following command in the inventory file of the version of AWX - any ideas?